Fan controllers have hardly been the stuff of copious Internet chatter, apart from the Digidoc 5 back in... hmm... 2001? Do you remember back that far? Back then the 'doc-five was a revolutionary controller that auto-adjusted fan speeds to meet a set temperature. It was expensive and had some basic flaws, but loads of people bought one and there was never really anything that replaced it. 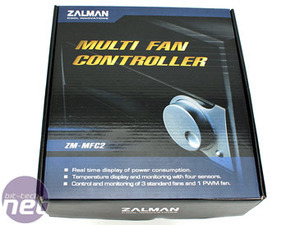 Instead we had an influx of cheap, manual fan controllers from the far east that still fill the "accessories" area of most etailers even today. Shoot forward to this year and back at i31 in August we saw QuietPC demonstrating the latest Zalman kit, including the ZM-MFC2 fan controller. Like a kid at Christmas, I was instantly drawn to its funky LCD readout, taking all sorts of out of focus and over-exposed pictures because we were all too light headed from this new found plaything. But, alas, we were told by QuietPC that samples were very thin on the ground because Zalman was having trouble making it. It seemed the little device was complicated to manufacture and the guys on the stand didn't know when they were going to get adequate stock. The same is still true for QuietPC, who, at the time of writing, have a 17-day lead time on the product still, but other UK e-tailers have started to get some stock. The ZM-MFC1 is the little brother to the device and is cheaper, but very much run of the mill when it comes to fan controllers simply because it comes without the LCD. 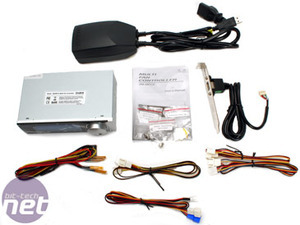 But does the LCD make the ZM-MFC2 all that we're expecting it to be? 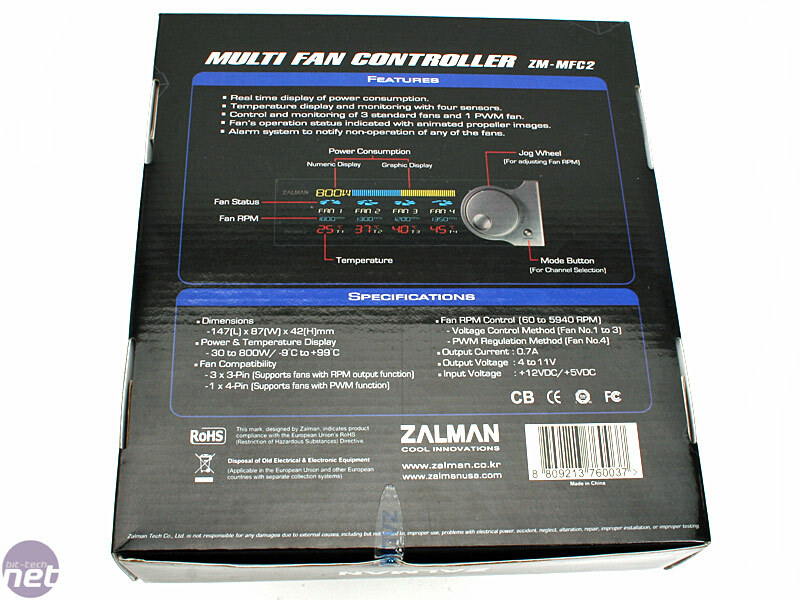 Zalman covers all of the options you might need, for 3-pin or 4-pin fans and even a pass-through cable for motherboards that won't boot without a CPU fan plugged in. The downside is that there's simply one of everything, but they are only extension cables or adapters so you can plug the fans in directly to the unit if need be. You're supplied with four thermal probes, each of which comes in the box with little plastic sleeves over the ends to protect them when they're not being used. It's a cheap solution but a nice attention to detail there. Unfortunately the fan connectors are all linked together and plug in as one, so if feel you don't need all four thermal probes then you have to tuck the spares away somewhere, instead of just leaving them unplugged. Finally the last thing included in the box is rather clever - it's the little black box pictured right. The little black box plugs into your wall power socket, then the box plugs into your PSU, providing the PC with power, as well as plugging into the USB bracket for the ZM-MCF2. It tells you the power draw of your entire PSU at the wall socket which is actually quite a novel feature and strangely interesting to keep track of. This isn't particularly neat but we can't see much of a way around it for the functionality, but regardless it's an incredibly stylish solution to the problem though. 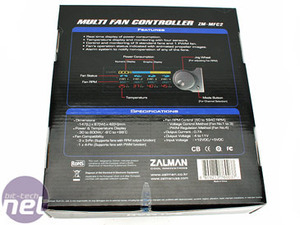 This dual-channel fan controller can keep your PC cool and quiet via temperature-controlled magic! This cooler is great, but only if you've already got a pair of quiet fans to use with it.